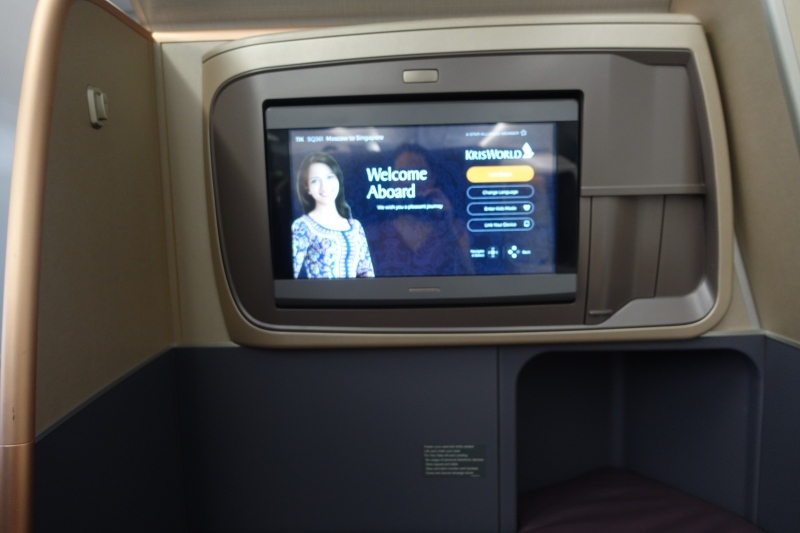 This Singapore Airlines A350-900 Review is from our flight from Moscow DME to Singapore SIN, an overnight flight. 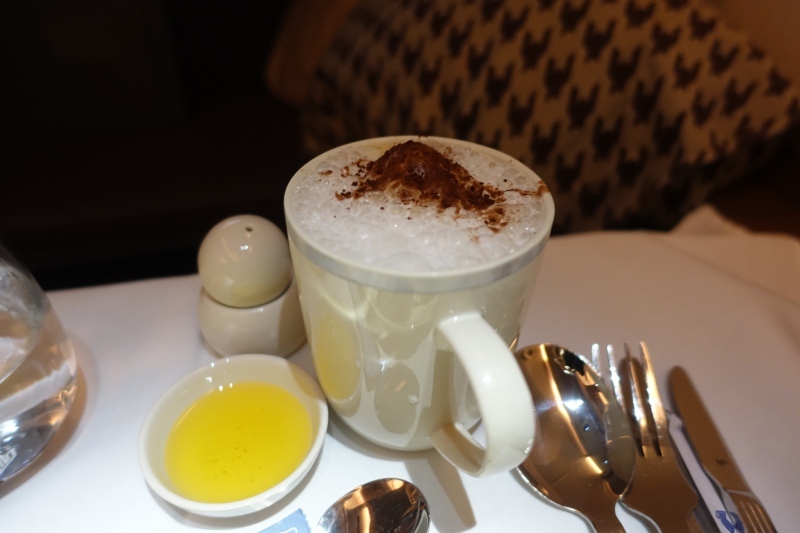 Also see our Singapore First Class 777 Review, Singapore Suites A380 Review, and all our posts tagged Singapore Airlines. 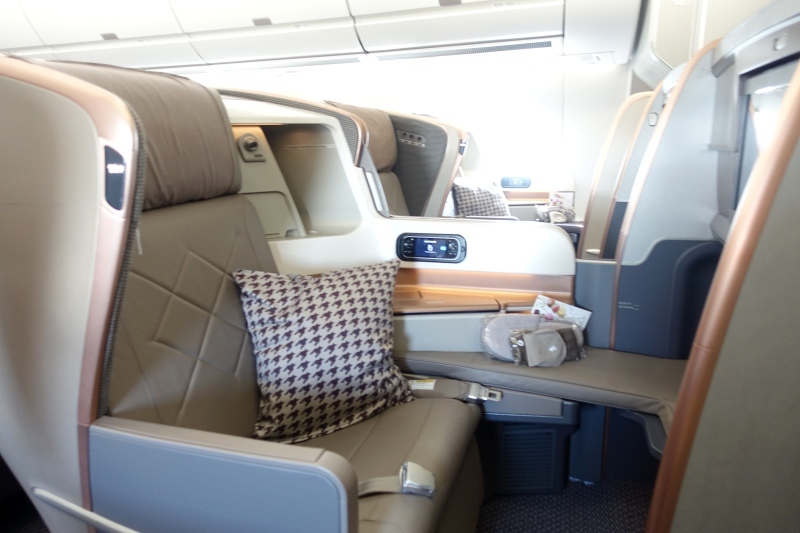 Singapore Airlines A350-900 Business Class has 42 seats in a 1-2-1 configuration in two business class cabins, with row 11 (first row of business class) to row 18 in the first cabin, and row 19-22 in the second cabin. While row 19 has some extra legroom, it's also the bassinet row, so these seats may be needed for those traveling with infants. It's also right near the galleys, so there can be noise and light interference. Because of this, we chose window seats 11K and 12K in the front cabin. 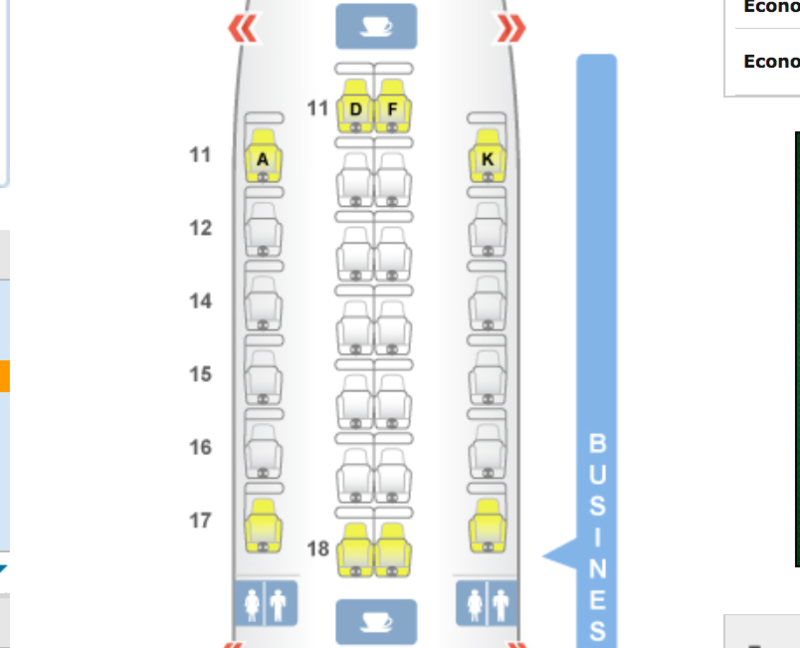 Singapore is known for having the widest Business Class seat, at 28 inches across. The seat is indeed roomy, although as I'll describe below, I'd gladly have traded some of this for a more comfortable bed. 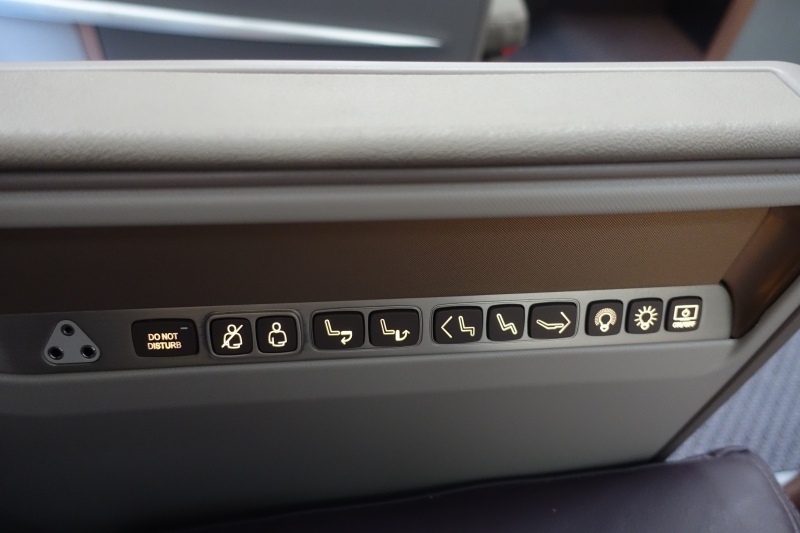 The seat controls are intuitive, although don't expect to recline the seat into a bed, like most other business class seats. Instead, you have to move the seat back to its fully upright position and flip the back of the seat down. Already at our seats were a sleep mask, compression socks and slippers. There's no amenity kit for Singapore Business Class, but there are toothbrushes and toothpaste supplied in the Business Class bathrooms. Prior to dinner, some mixed nuts (room temperature, not warm) were served, along with a drink of our choice. 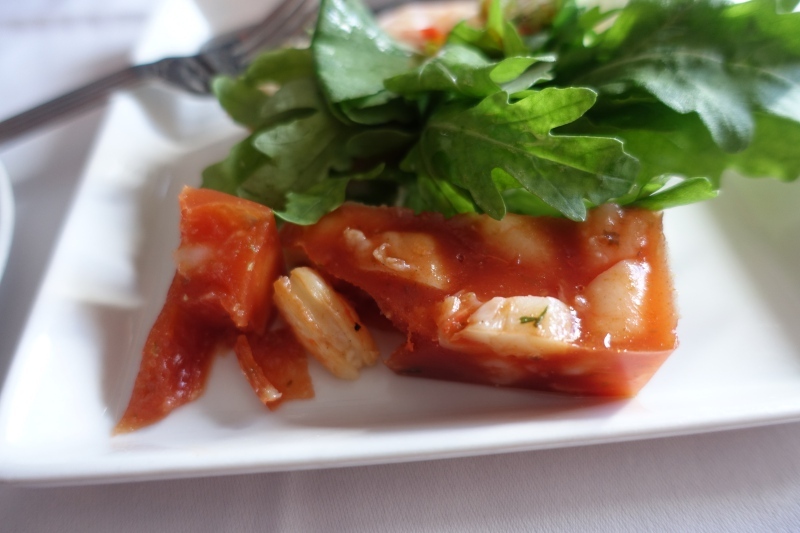 For dinner, there was no choice for the appetizer, which was a salad with prawns in tomato jelly (aspic). 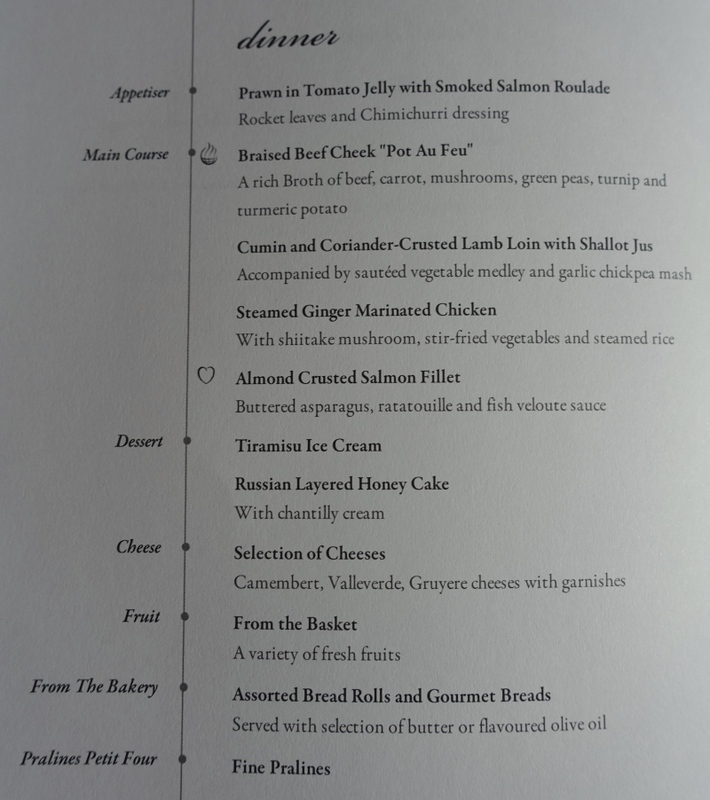 I liked the prawns, but I've never liked aspic, or anything gelatinous, so I wasn't too fond of that part. 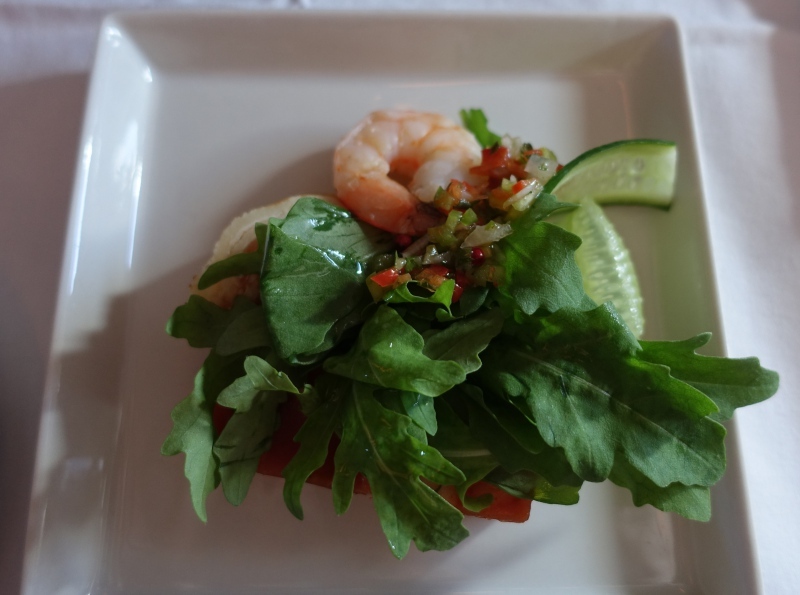 The smoked salmon roulade was good, and the salad was fresh, however. I chose the cumin and coriander crusted lamb for my entree. 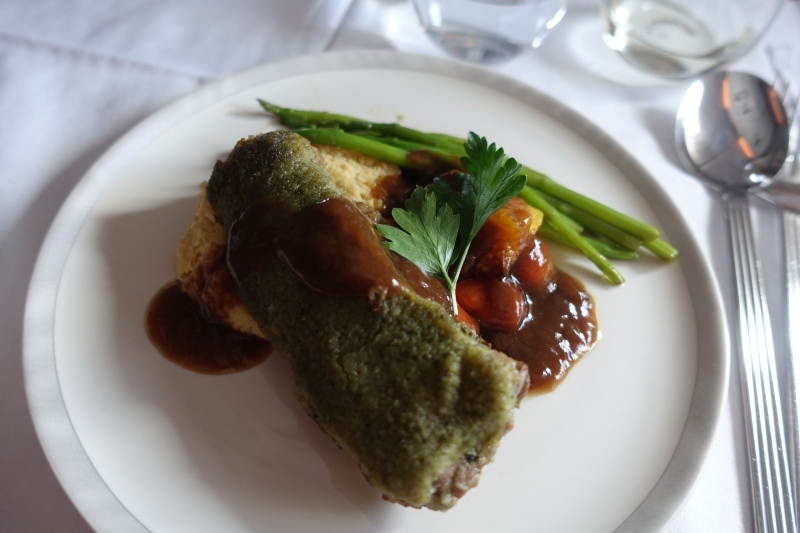 I liked the flavor of the cumin and coriander crust, but the lamb itself was quite tough, as often happens on flights for something that is not braised or stewed and reheated. The asparagus were nearly perfectly cooked however, and only slightly overdone. 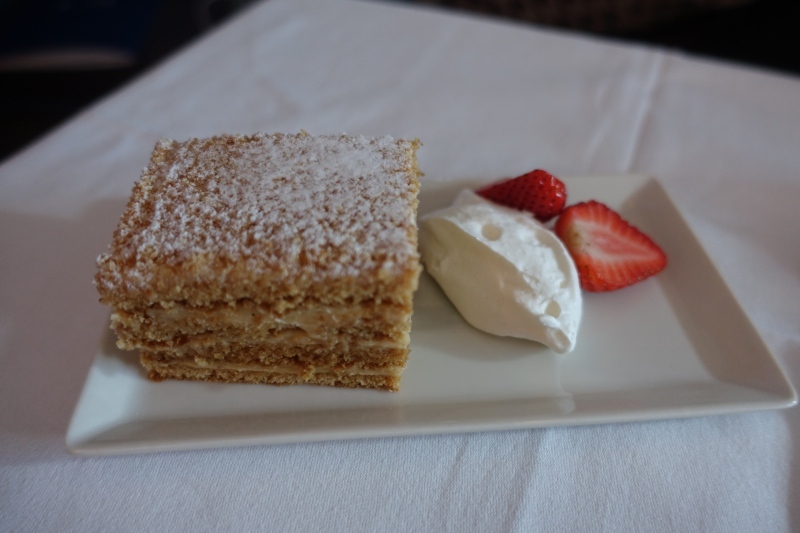 Dessert was the classic Russian medovik (layered honey cake) and very tasty, probably the highlight of the meal since it keeps well and there's no reheating involved. My son enjoyed the cheese plate, although he passed along the stronger flavored cheese to me. There was nothing too memorable about the cheeses, but that's not surprising since the catering was from Russia, where imported cheeses are expensive now due to the sanctions. 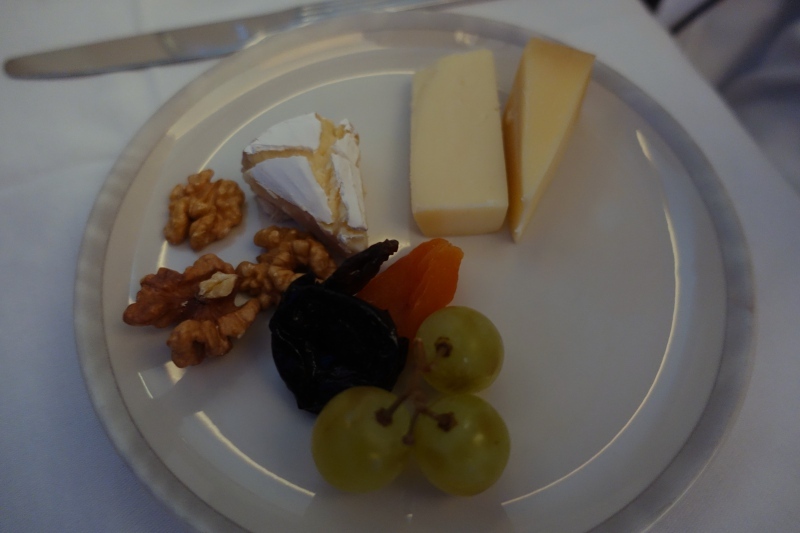 There are plenty of good quality fresh dairy products and soft cheeses, but hard aged cheeses are not a Russian forte. 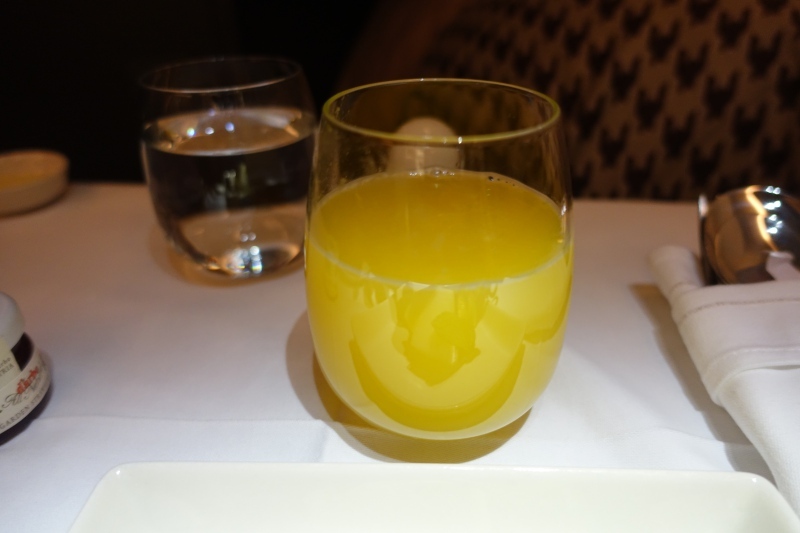 For breakfast the next morning I started with orange juice, which was the one freshly squeezed juice on offer, as the others were chilled. 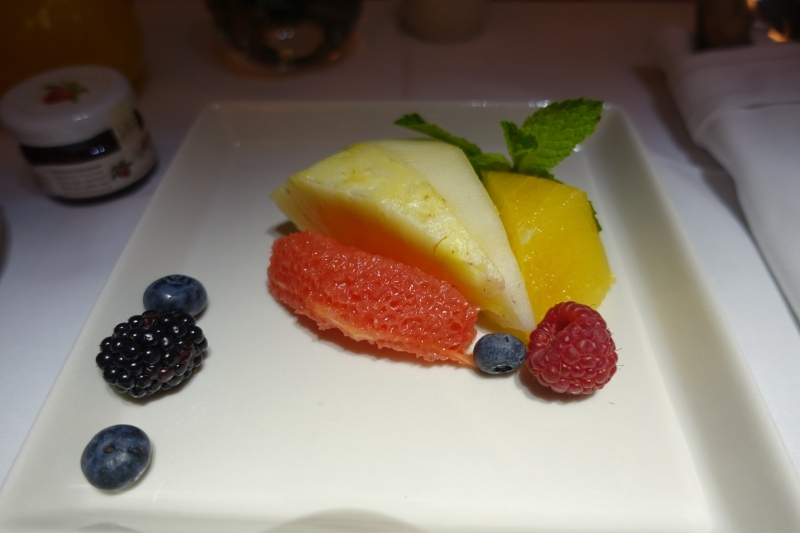 I also tried the fresh cut fruit, which was better than expected, since it included not only pineapple, orange and grapefruit (and melon, which I don't like), but also a few berries: a raspberry, a few blueberries, and a blackberry. 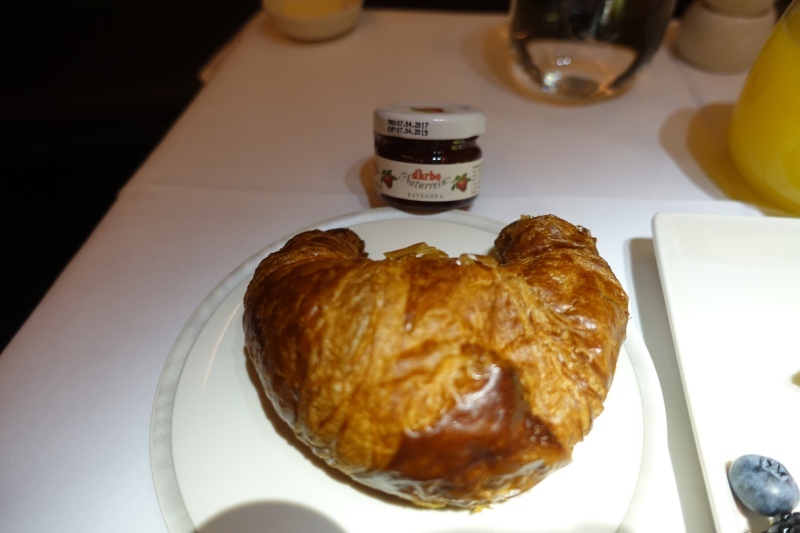 Plus, there was d'Arbo jam for the croissant I had, and d'Arbo makes excellent jam. 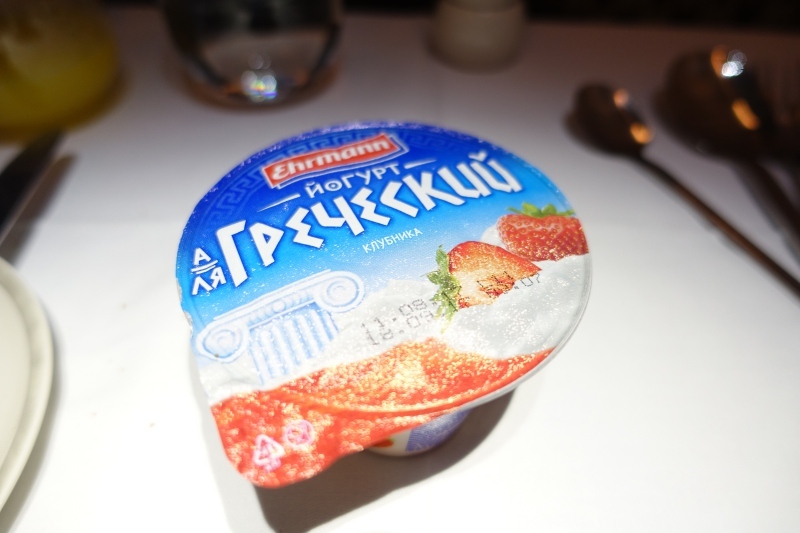 I also had the Greek strawberry flavored yogurt, which was Ehrmann brand. I hadn't tried the Ehrmann brand before, but liked the plain yogurt, if not the strawberry part, which was syrupy and lacked any chunks of real strawberry. 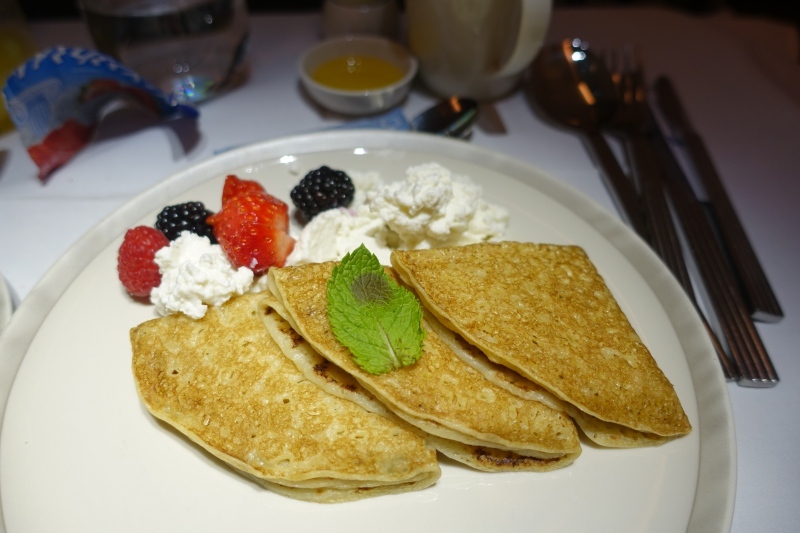 My son and I shared these Russian blini with farmers cheese and berries on the side. Very tasty, and a nice perk of a flight departing from Moscow, since I doubt these are served on any other Singapore Airlines flights. 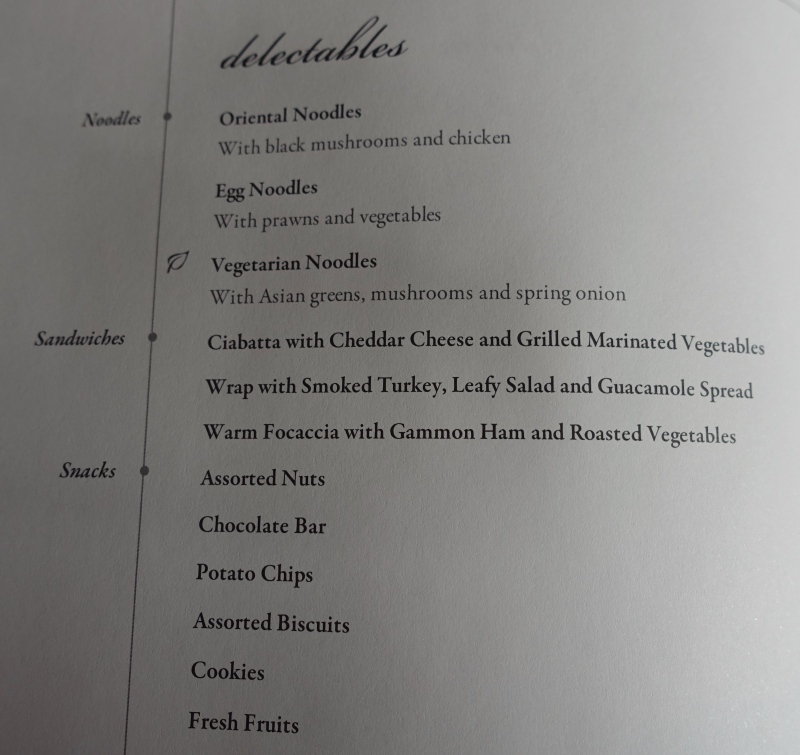 As always, the KrisFlyer IFE choices were extensive and excellent. I don't tend to watch much on flights, preferring to sleep or work, but ended up watching ‘Aina: That Which Feeds Us, a documentary about the toxic pesticides being tested by DuPont-Pioneer, Dow, Syngenta and Beck's. While NYC may not have the cleanest air, watching this film made me very happy not to be living in Kauai, given all the tons of highly toxic chemicals the companies are spraying on their experimental GMO crops in Kauai. But if documentaries aren't your thing, there's a huge variety of new releases not just from Hollywood but from Asia and Europe as well, and also kids' films, cartoons and games. The latter kept my son grinning during his waking hours. 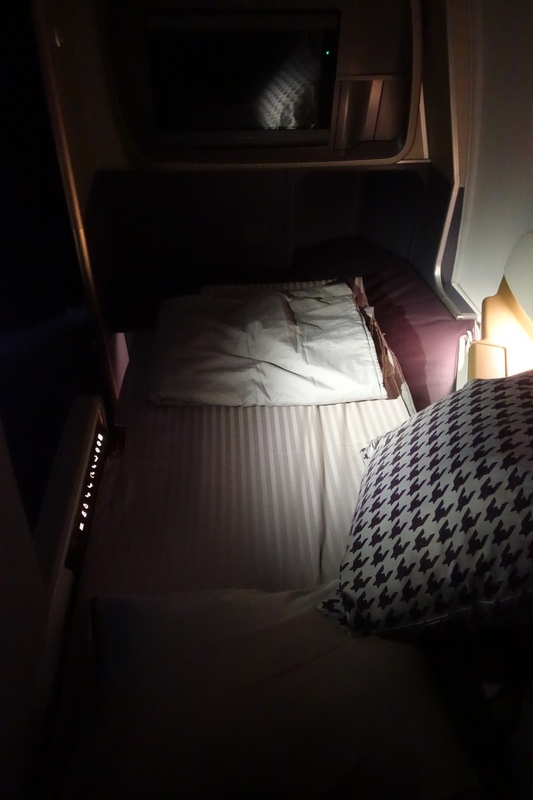 I found the Singapore Business Class bed very wide, but very uncomfortable, due to its firmness and the awkward angle you have to sleep in given the cubby for your feet. I also found it difficult to fold the bed back into a chair. I know that the design is meant to give you a more comfortable sleep surface than simply reclining the chair into a bed, but I found it one of the most uncomfortable fully flat beds I've slept on. I infinitely prefer JAL Business Class, with its memory foam mattress pad, or even most other fully flat beds where I can put my Therm-a-rest and don't have to angle my legs and feet diagonally. This is the first time I've traveled on a Singapore Business Class flight of this length, and it was colored by the fact that I got virtually no sleep, due to the baby traveling with the family in seats 11A, 11D and 11F. It's not that she was crying constantly, but when she did yell (even happily) she was very loud. 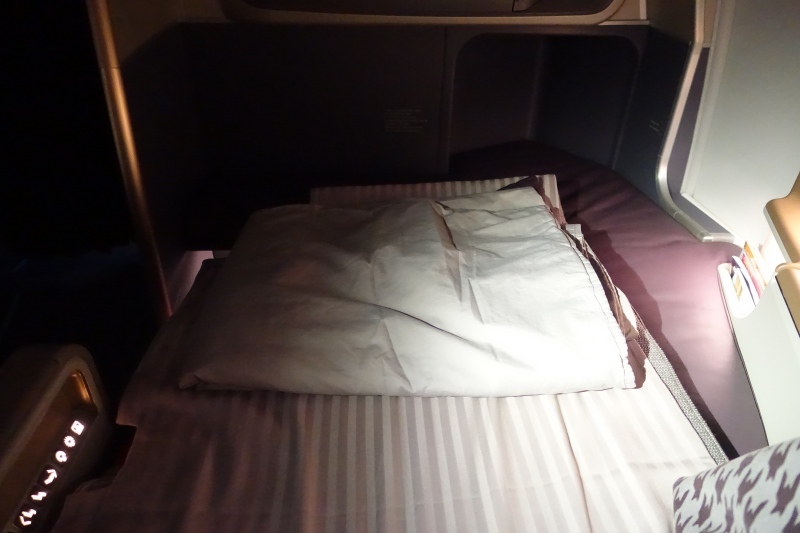 But even apart from the baby, I found the Singapore Business Class bed incredibly uncomfortable, due to how firm it was. 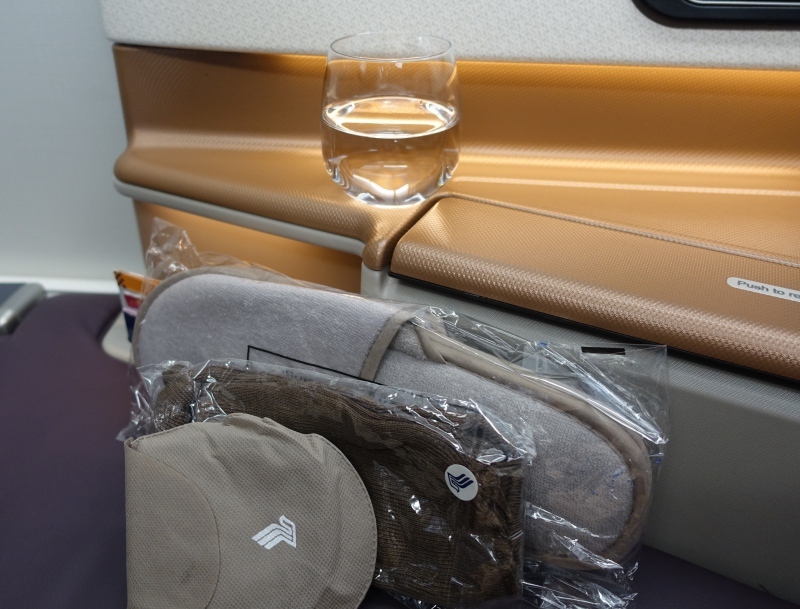 I purposely decided not to use my Therm-A-Rest for this flight, to gauge the comfort of the Singapore Business Class bed without it, and the verdict for me (and anyone who uses a memory foam mattress at home) is: not comfortable at all. In addition to the firmness, the bed was awkward due to the cubby for your feet, even for 11K, which has no seats in front of it. You have to angle yourself, and if I found it awkward at 5'7, I imagine it's even more uncomfortable for someone taller than I am. 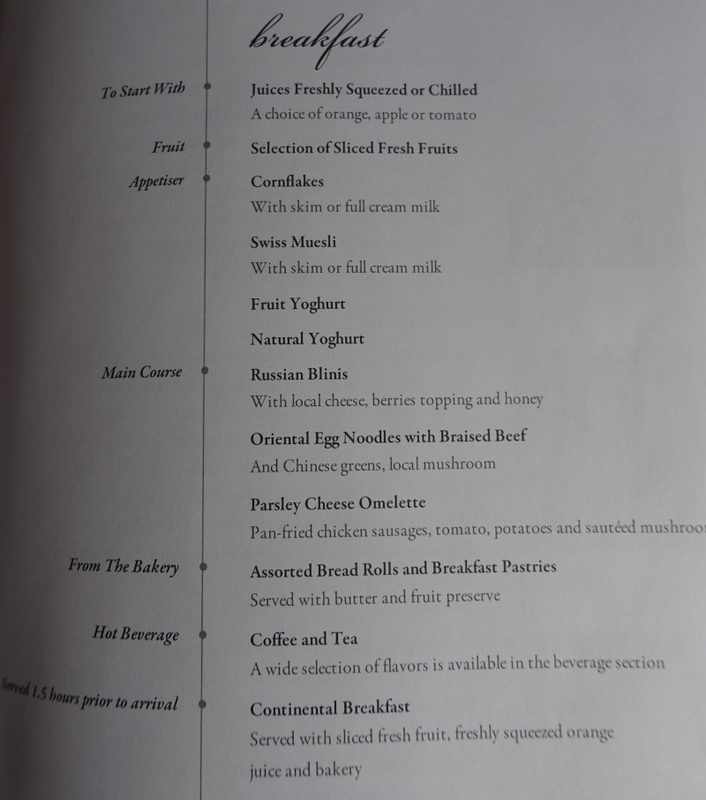 There's no Book the Cook pre-ordering for Moscow to Singapore, but the menu was fine for business class. Sure, I'm not fond of aspic or gelatinous foods, and the lamb was a bit tough, but the salad was fresh, the herb crust on the lamb was flavorful, and my son's blini with farmer's cheese was tasty. Service was understandably a bit preoccupied given the number of seats in business class, and not proactive, but about what I expected for business class. For more personal service, you definitely need to book first class. 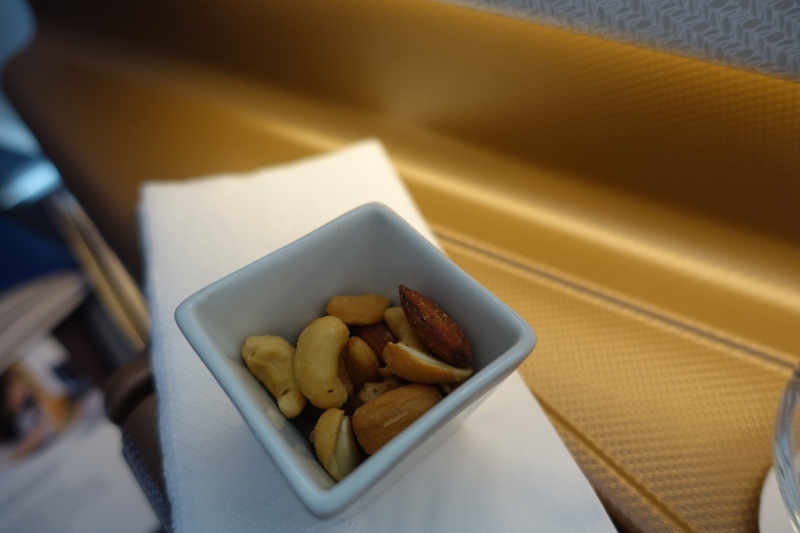 If you've flown Singapore Business Class on the A350-900 recently, what was your experience? If you enjoyed this, join 200,000+ readers: please follow TravelSort on Twitter or like us on Facebook to be alerted to new posts. Get travel inspiration from TravelSort on Instagram!